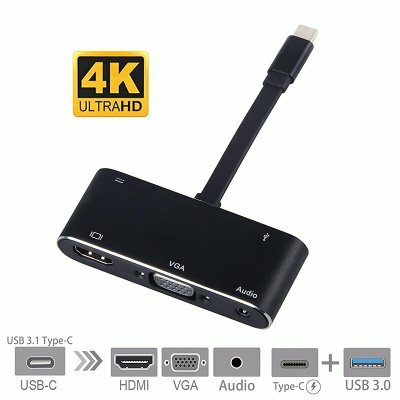 Successfully Added USB C to HDMI Adapter 4K 5 in 1 Type-C to HDMI/VGA/ Audio/USB3.0 Port+USB C Port to your Shopping Cart. 5 in 1, USB-C 3.1 input,HDMI output (4Kx2K),VGA output(1080P),3.5mm Audio output,USB 3.0 interface,Type-C PD port(only charging). HDMI output resolution up to 3840x2160@30Hz Ultra HD, VGA output up to 1080x1920. USB 3.0 Technology supports max current 0.9A, providing you high speed transmission up to 5Gbps. Backwards compatible with USB2.0. Transfer your data easily. HDMI and VGA can be used at the same time.